Dentistry is full of myths and horror stories that seem to serve only to frighten patients that come in for dental exams. An endodontic – or root canal – treatment is one particular service that strikes fear into anyone in need of the procedure. 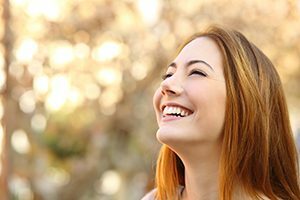 As Concord’s general dentistry experts, we’re here to dispel the myths surrounding this treatment and its benefits. Concord Smile strives to be your local dentist for all of your smile’s needs, from regular cleanings to full tooth extractions. 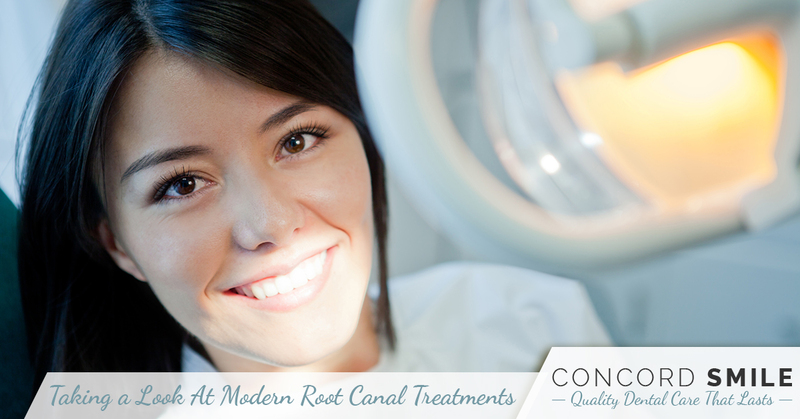 Today, we’ll look at what a modern root canal consists of and how it can improve your overall health. The health surrounding your smile is what is important to us, so we strive to keep your grin radiant! Your tooth is composed of several components, from the protective enamel to the roots within. At the center of each tooth resides the pulp, a living tissue that is comprised of blood vessels and nerves in order to promote proper growth during childhood. When this pulp becomes infected, whether from tooth decay, gum disease, or anything in between, it can become inflamed and start to damage the tooth and surrounding areas. If left untreated, the health of the tooth in question will suffer, as will the tissues it comes into contact with. The result for you is tooth pain, ranging from inconvenient to severe. An endodontist will need to come in and treat the infected area. After your anesthesia is administered, a thin piece of rubber will be applied to the infected tooth, actively protecting the procedure against bacteria and saliva. A drill will be used here to gain access to the pulp, where a specialized tool is then used to clear out the infected material. Once the pulp is cleared out, the empty chamber is then carefully cleaned and disinfected to protect against any further issues. A rubber-like material will be used to perfectly fill the space left behind by the pulp. This material, referred to as gutta-percha, will work with an adhesive to fill and seal the inside of the tooth, creating a sealed surface. It is vital here to ensure that everything is sealed up tight. Once this is done, the surface of the tooth will require a filling or a crown based on your specific needs. Recovery from this point should be quick and relatively painless, assuming that no bacteria gets in and infects the new implant. The first thing people think of when they hear “root canal” is pain. Modern advancements, however, have made the procedure quick and essentially painless. The nerves in your tooth reside within the pulp, equating to no pain once that pulp is removed. Root canal treatments serve to actually relieve pain, not cause it. Receiving this treatment will also serve to save the tooth, which is a much-preferred option to extraction. Root canal treatments have come a long way in the last few decades. Technology and proper training help to make the procedure quick and typically painless. While not the most fun service, people in need of an endodontic treatment will much prefer it to tooth pain, infections, inflammation, and tooth loss. Concord Smile strives to be your go-to family dentist for all of your dental needs. From dental fillings to restorative implants, we do it all. If you are searching for Concord’s best general dentistry practice, feel free to contact us today to schedule your dental exam!